. . . In a recent interview, Trump declared that he believes "strongly in just about all conservative principles," is "pro-life" and against gay marriage. He has attacked President Obama's health care law and said that the United States has become the "laughingstock" of the world. This is the same Donald Trump who has changed party affiliation from Republican to Independent to Democrat and back to Republican, according to a report. Trump has said in interviews with CNN that he identifies more with Democrats than Republicans; that the party handles the economy better than Republicans; that President George W. Bush was "probably the worst president in the history of the United States"; and suggested that Bush should have been impeached for what Trump called "lies" over a "horrendous mistake": the Iraq war. In 1999, while flirting with running for president under Ross Perot's Reform Party, Trump told the New York Daily News that he supported abortion rights and universal health care.Trump and his representatives at the Trump Organization did not immediately respond to CNN's request for comment. . . . In a Monday interview, Trump defended his conservative bona fides. "I'm a very conservative person. I'm very big into the military. I'm a great guy for defense," Trump told Greta Van Susteren of Fox News. "I am probably as conservative as anybody on your show, and that's going a pretty strong step." He added: "I'm a very conservative Republican. I believe strongly in just about all conservative principles." . . . Does anyone believe that whatever Trump says that he believes today he will believe two years from now? I have been seeing this ad from Bloomberg's Everytown for sometime, so I was pretty stunned when I noticed that as of this afternoon it still only has 292 likes. The point of the link is to get people to sign a petition that will be delivered to Kroger. 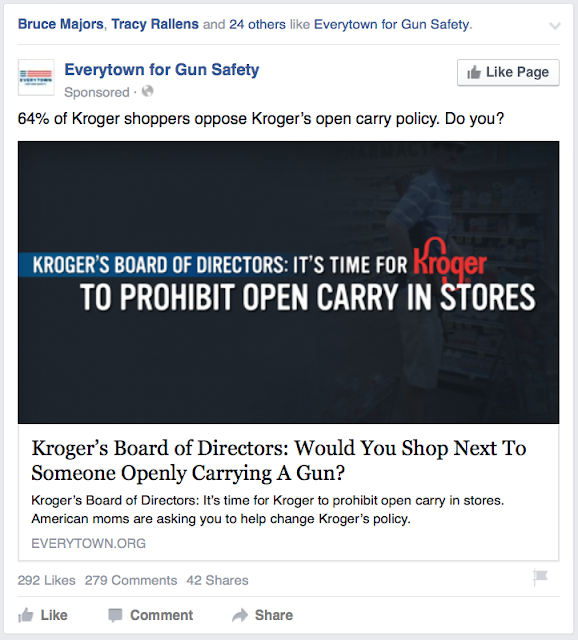 The 279 comments also appear to be overwhelmingly by people who disagree with Everytown. I have no idea exactly how much money Bloomberg spends on these ads, and I am sure that this is only a tiny amount of money to him. But for a group that claims to have 2.5 million members, this is a very weak showing. Of course, this membership number is pretty meaningless as these aren't dues paying members, just people who have agreed to be on Bloomberg's email list. I assume that a number of those are those who support gun ownership and just want to see what Bloomberg is up to. "China to Embed Internet Police in Tech Firms," So these are the guys Obama wants to give control of the internet to? China’s government plans to embed cybersecurity police units at major Internet companies and websites to help prevent crimes such as fraud and “spreading of rumors,” state-run Xinhua News Agency reported Tuesday. It is an unusually hands-on approach by Beijing, which typically sets censorship standards and puts the onus on companies to comply. China’s Internet regulator has previously favored tactics such as threatening to shut down services that didn’t meet censorship requirements. . . .